As discussed in my article about depicting variation of flavor in vintages of wine, terroir is the characteristics of the overall environment that impact the production of any type of agriculture (not just grapes). Terrain, amount of rainfall, soil type, temperature and climate are all terroir characteristics that influence grapes and wine. Did you know that regions with hilly terrain and lousy soil that inhibit moisture retention are best for growing grapes? Excess rain and moisture causes grapes to be large and juicy. While this is favorable for grapes you eat, wine grapes should be small to produce condensed juice with a more intense flavor. This type of growth is best achieved on hilly terrain, where water can run off easily. 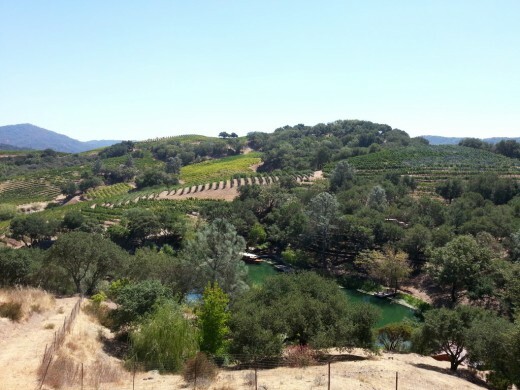 The picture below depicts the hilly terrain of vineyards and was taken at the beautiful Kuleto Estate in St. Helena, California. Soil type also plays a role in water retention. Regions with large amounts of gravel, sediment, rocky soils or volcanic soil are the best for grapes because these soils are not able to retain moisture. The best way to understand this concept is to think about a bucket of large rocks and a bucket of fine sand. Add water to both buckets. The bucket with gravel allows water to pass through easily, while the bucket with sand will absorb and hold onto that water. 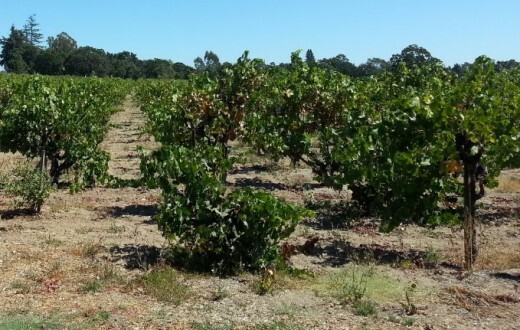 The Bordeaux region of France contains many areas of gravelly soils, while the Napa Valley and Sonoma regions in California are filled with sediment, rock and volcanic soil. All are great for inhibiting water retention and therefore growing grapes. Take a close look at the soils in the next two pictures. It’s not moist and dense, but dry, hard and filled with gravel. 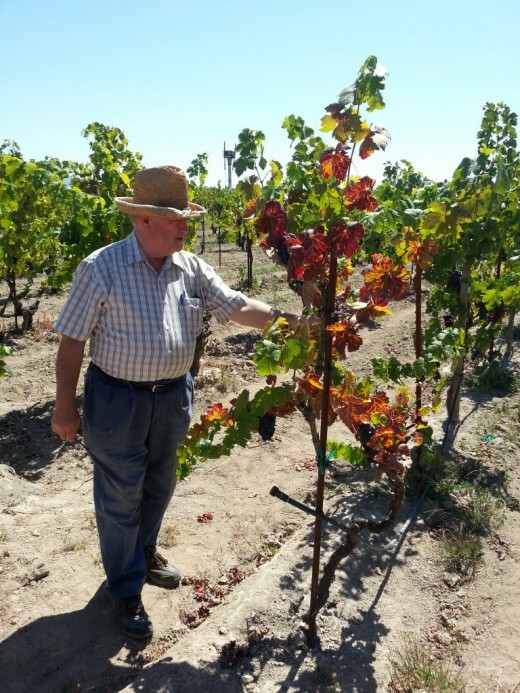 Battaglini Winery is one of my favorite wineries that I’ve visited, so I wanted to include this picture of Joe Battaglini showing off his 100 year Zinfandel vines. The picture also shows the type of soils in Santa Rosa, California. In addition to limiting water retention, minerals in the soils can add unique flavors to the wine. For example, a mineral-rich soil can add a stony or flinty hint to wines. This is common in the Loire region of France, while limestone rich soil is common in the Russian River Valley of California and the Sancerre region of France. Temperature and climate also impact wine because colder regions support the growth of different varietals than warm regions. 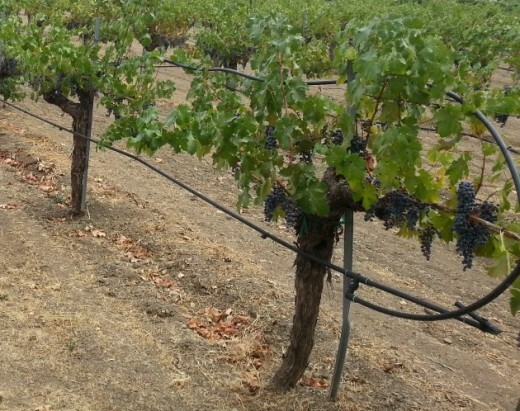 A well irrigated and hot environment encourages grapes to ripen very quickly, but cool, well-drained regions allow grapes to ripen over a longer period of time. The latter is more preferable because it encourages more complex flavors in the wine to develop. Chardonnay grapes and Pinot Noir grapes are best fitted for colder environments and that is why the Russian River Valley is well-known for those types of wine. Terroir is a very important factor when it comes to any form of agriculture, including wine production. It impacts grape growth, development and plays a large role in wine flavor. A great way to further your understanding of terroir is to taste two wines produced from the same varietal but from different regions. For example, purchase two bottles of Sauvignon Blanc, one from Napa Valley and one from the Loire Valley (where Sauvignon Blanc is referred to as Pouilly Fumé or Sancerre). Reference my wine tasting guide to take notes as you sample both wines side-by-side. Think about flavor intensity and its relation to rainfall, temperatures and grape growth. 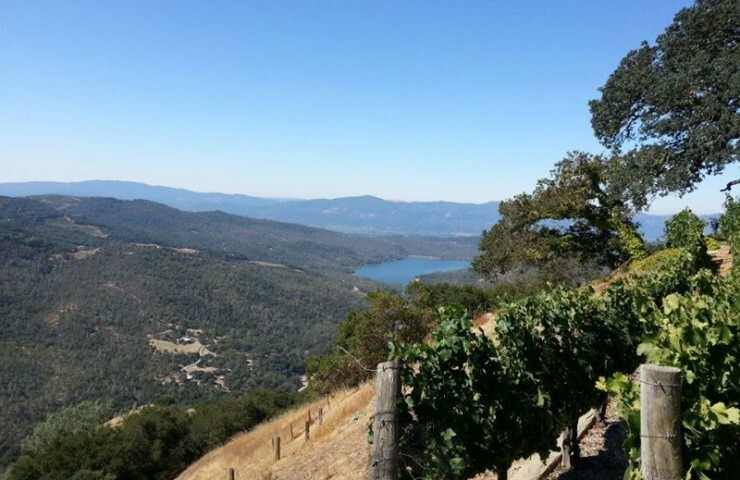 Consider soil types and terrain and how they impact wine flavor. Try to depict differences in flavor between the two bottles and try to figure out the reason for the change based on what you just learned about terroir. I hope this sheds some light on the significance of terroir and its impact on wine!